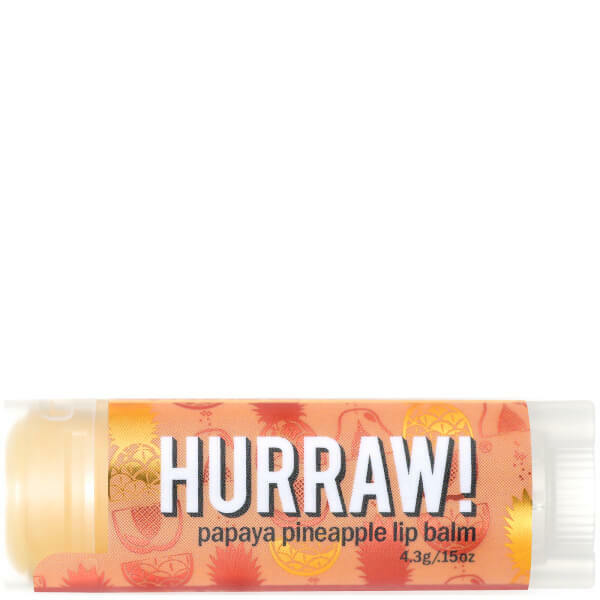 Drench lips in a tropical treat with the Hurraw! Papaya Pineapple Lip Balm; an ultra-hydrating formula that cares for skin using premium organic, vegan and raw ingredients. Formulated with over 60% Cold Pressed Papaya Seed Oil, the lip balm is rich in essential fatty acids, which envelop skin in a veil of nourishing moisture. The lip balm also boasts a generous dose of Papaya Fruit Extract, which works to eliminate dead skin cells and reveal ultra-soft and smooth lips. Complete with a delicious Pineapple scent, the lip balm leaves lips thoroughly nourished and completely kissable in one simple swipe. *Carica Papaya (Papaya) Seed Oil, *Cocos Nucifera (Coconut) Oil, Euphorbia Cerifera (Candelilla) Wax, *Theobroma Cacao (Cocoa) Seed Butter, *Ricinus Communis (Castor) Seed Oil, *Natural Flavours, Tocopherol (Vitamin E). *Organic & Cold Pressed. Subtle scent and lovely texture. Last on the lips well! This lipbalm has a subtle scent of Papaya, and is really nourishing on the lips. The packaging is streamline which means it fits into my pocket easily. Would recommend.